I wanted to try a night shot of towns and traffic at night using long exposure. I played around with different settings but the one I liked best was a 10 second shutter speed, ISO 100. I put the camera on the dashboard as we were driving home. Have you tried it using a tripod? You can get some interesting stuff that way. Personally, I hate tripods, but they can be useful. This was taken through the windshield as we were driving. But I love the tripod for indoor photography when taking pictures of objects. My husband loves it for outdoor use. Love the remote too! Hahahaha! You’re a funny guy! of a moving vehicle and I like the results. Thanks, rezinate! It was fun to try something that I hadn’t done before. Love these kind of discoveries. I never thought of that. I would! Thanks, Irene! These are fun. reminds me of writing, cursive or writing in a foreign language. Very cool. Great photos! I love their abstract quality! Very Cool!. I love the long golden one. Thanks, lwbut! It was fun to try. 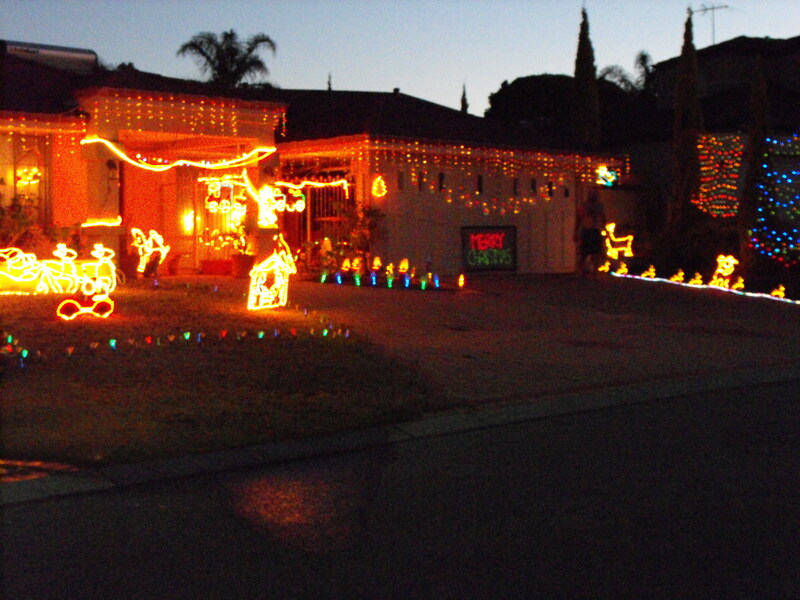 I wonder what it would be like to do houses all done up with Christmas lights, I can’t wait to try it on them. I meant to take them tonight. Oh well, there are other days. I will have to nab Rebel Guys zoom lens for it. Dutch Goes the Photo did some how to posts on what I want to try. It looks pretty cool. Very cool. I like how you experimented with this even if it isn’t necessarily what you like in photography., that it was fun and you want to try your hand at everything. Watching you and other bloggers experiment, try out different things inspires me to stretch my imagination and I greatly appreciate this. Thank you, Arati! I appreciate that.